A worthwhile story with useful anecdotes for someone mildly interested in wine and the lifestyles of the wealthy. The plot line is profoundly more gripping when read from a "let's see what cool stuff happens next" viewpoint rather than from getting too invested in any single character (or the book's title). The ending leaves a lot to be desired. If "they" can turn this into a major motion picture, I will go see it solely because I don't believe this has screenplay potential. Without Bill Koch or the Kleins, what would the book be? For decades, people were too embarrassed to question provenance of wine they were paying five figures for and it took an eccentric billionaire to sow the seeds of doubt. One mastermind counterfeiter fooled everyone but, without his former neighbor's testimony, the type of exposé you spend 8/9 of the story hoping for, you'd feel uncomfortable reaching the conclusion that the author guides you toward. The Billionaire's vinegar gets the job done, but only about as gracefully as one can "get the job done". Desirable tangents not explored. Memorable rather than forgettable; leaves a peculiar taste in your mouth. 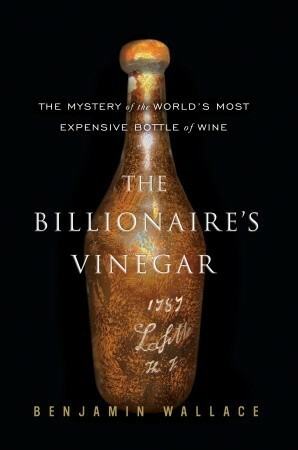 Sign into Goodreads to see if any of your friends have read The Billionaire's Vinegar.